Chiropractic can provide a safe, solution for headaches and the prevention of migraines. care for such conditions has been proven safe, with far less possible side effects when compared with aspirin and other common painkillers. For about 20% of the population, these headaches are chronic or recurrent. The World Health Organisation (WHO) has defined the structures responsible for headaches and migraines to include the neck, the scalp muscles and vessels, and the brain covering sheath. The most common causes of headache are dysfunction of the joints in the neck, physical trauma, emotional stress, nutritional imbalance, dehydration and visual strain. These are all common benign conditions that are easily recognised and treated. 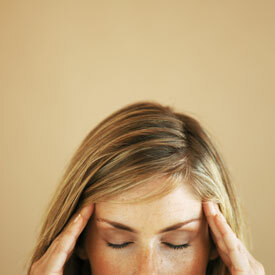 However in rare cases, headaches and migraines can be a sign of a more serious problem. Neck (cervicogenic) headache – where problems with the joints and muscles of the neck refer pain into the head. Unlike pain killing drugs, we treat the cause of the pain not just the pain itself. We will carry out a full examination (including x-rays if necessary) and ask you detailed questions about your medical history and lifestyle, to discover the cause of your headaches. Once the diagnosis has been made, we will use a variety of specific manipulation or adjustment techniques in order to mobilise (free) the neck joints, stretch, relax and strengthen the neck muscles and remove spinal nerve irritation. This can be combined with physical therapy, massage and exercise. Some patients enjoy almost immediate relief, whilst others notice a gradual easing of their symptoms over a period of several weeks. This will depend on the nature and chronicity of the problem. Call for more information or an appointment – SpineLab.